The U.S. Women's Gymnastics Olympics Trials kick off Friday night in San Jose. 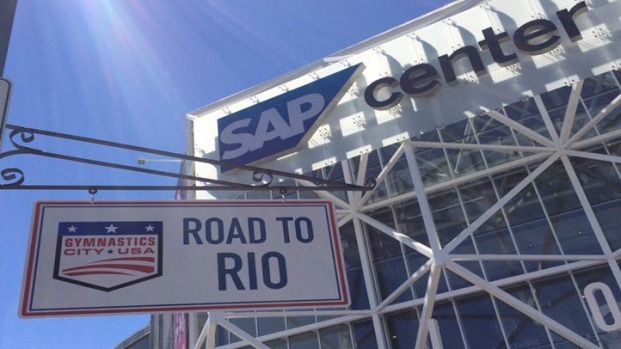 Thousands of fans will flock to the SAP Center as Olympic hopefuls — including frontrunners such as Simone Biles, Gabby Douglas and Aly Raisman — vie for five coveted spots to represent Team USA in Rio. In all, 14 women will compete in the trials. Gymnastics legend and coach Bela Karolyi kicked off the festivities Friday afternoon outside the SAP Center. "We are going to win!" Karolyi said to cheers from the crowd. "USA! USA!" Fans trickling into the event were decked out in red, white and blue. The other four spots on the team will be filled based on a number of factors, including the 13 remaining gymnasts' scores, consistency, presentation, physical ability and readiness. In the wake of the Dallas shooting, police are increasing security at the SAP Center for the Olympic Trials. Jessica Aguirre and Scott Budman reports. The Olympic Selection Committee also will consider performances by Brenna Dowell, Rachel Gowey, Laurie Hernandez, Madison Kocian, Maggie Nichols, MyKayla Skinner, Christina Desiderio, Ragan Smith, Amelia Hundley, Ashton Locklear, and Emily Schild.